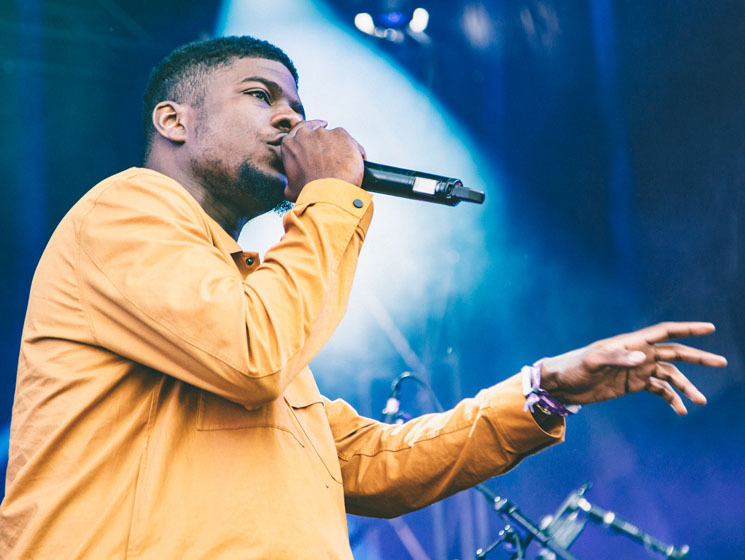 After a weekend mired by cancellations from artists flying in from Lollapalooza, Chicago-based rapper Mick Jenkins took to the valley stage triumphantly on Sunday afternoon. Sporting a mustard-coloured jacket and backed by a DJ and drummer, Jenkins launched into his set with a broken mic — the heavy beats drowning out his voice as the audience yelled out and pointing to the air in an effort to get him to turn it up. It took two songs before the tech team realized what was happening, making for a rocky start to an otherwise smooth set. Getting the crowd to chant "drink more water," Jenkins dipped into "Jazz," off the critically lauded mixtape The Water[s], while bathed in blue light. Strolling about the stage, Jenkins' effortless, poet laureate flow carried him through "Plugged" and then "Spread Love" off his debut album The Healing Component. In comparison to other rappers who take to the stage screaming their lyrics, spurred on by pure adrenaline, Jenkins stayed cool, gliding across the stage with a raw sense of bravado mixed with a bit of palpable nervousness as he rapped about love and political injustices. An intelligent artist still trying to figure out a way to translate an album into an exciting live festival show, Jenkins ended his set strong with "514," letting the Montreal crowd in on his love of poutine.